The Item Responder chip is an item added by the Project Red mod. One of many chips used in conjunction with a Routed Interface pipe . The chip is used to configure the interaction between the pipe and the inventory. The Item Responder sets the pipe to request, or block (blacklist), a specific set of items from the connected inventory. This allows for a single pipe to have the properties of multiple Routed pipes, allowing for compact yet complex sorting. The Item Responder can be upgraded using the Router Utility. 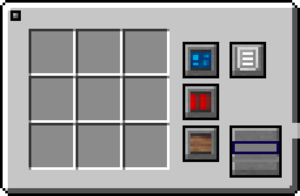 'Right-click' in the air to open the chip GUI. Once configurated install the chip by 'Right-clicking' the pipe with the chip. Alternatively, 'Right-cliking' without the chip opens a GUI to place the chip in one of the 4 ports manually. Hovering the mouse over will show the configuration status in a tool tip for each option. 'Clicking' on an option opens the coresponding GUI. Meta is checked (default) or is ignored. NBT is checked (default) or is ignored. Oredict is checked (default) or is ignored. Tools are grouped at 25%, 50%, 75% or 99%. Item Responder chip has no known uses in crafting. ↑ The Interface Pipe is the replacement to Red Power's Pneumatic Tube. This page was last modified on 19 May 2016, at 18:19.